Formed in 2008, the Fantastic (Fantasy, Horror, and Science Fiction) Area will hold its eleventh-anniversary and farewell sessions in 2018, and we seek proposals from scholars of all levels for papers and/or panels that explore any aspect of the intermedia traditions of the fantastic (including, but not limited to, elements of fairy tale, fantasy, gothic, horror, legend, mythology, and science fiction) and how creative artists have altered our preconceptions of these subtraditions by producing innovative works in diverse countries, media, and time periods and for audiences at all levels. Presentations will be limited to 15 or 20 minutes in length depending on final panel size. An archive of previous work in the area exists at our website Northeast Fantastic (https://northeastfantastic.blogspot.com), which is intended as a gateway to furthering research on the fantastic. Given the proximity of the conference to Halloween, we are always interested in proposals related to monsters and the monstrous. This year, we are also looking for papers related to the fantastic in children’s culture, especially the works of the Walt Disney Company. Furthermore, in celebration of the two hundredth anniversary of the publication of Mary Shelley’s Frankenstein in 2018, we are organizing a special session devoted to “Frankenstein 1818 to 2018: 200 Years of Mad Scientists and Monsters.” Details can at our outreach site Frankenstein and the Fantastic at https://FrankensteinandtheFantastic.blogspot.com/. Please contact area chair Michael A. Torregrossa at cfp.nepcafantastic@gmail.com, using “NEPCA Fantastic 2018” as your subject line, with any questions in advance of the 1 June 2018 deadline. Submissions for papers and/or panels should be made online through the “2018 Proposal Form” at https://nepca.blog/2018-conference/. Please select “The Fantastic (Fantasy, Horror, and Science Fiction)” as your designated area. A complete submission includes contact information, academic affiliation (if any), an academic biographical statement (between 50 and 200 words), a paper title (no more than 60 characters), and a paper abstract (no more than 250 words). Do also send copies of your biography and proposal to the area chair at cfp.nepcafantastic@gmail.com, using “NEPCA Fantastic 2018” as your subject line. 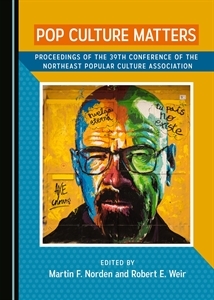 The Northeast Popular/American Culture Association (a.k.a. NEPCA) was founded in 1974 as a professional organization for scholars living in New England and New York. It is a community of scholars interested in advancing research and promoting interest in the disciplines of popular and/or American culture. NEPCA’s membership consists of university and college faculty members, emeriti faculty, secondary school teachers, museum specialists, graduate students, independent scholars, and interested members of the general public. NEPCA is an independently funded affiliate of the Popular Culture Association/American Culture Association. Membership is open to all interested parties, regardless of profession, rank, or residency. NEPCA holds an annual conference that invites scholars from around the globe to participate. In an effort to keep costs low, it meets on college campuses throughout the region. Membership in NEPCA is required for participation and annual dues are included in conference registration fees. Further details are available at https://nepca.blog/membership-information/.